Gently cleanse and rid hair of impurities while Vitamins A&E and strengthening proteins nourish and prepare hair for thermal styling. 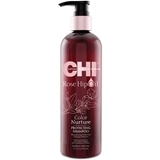 CHI Argan Oil Shampoo combines a unique blend of exotic oils that gently cleanse and rejuvenate dry, damaged hair by restoring moisture, essential vitamins, antioxidants and strengthening proteins creating healthy, shiny hair. Hydrate shampoo. 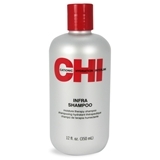 CHI Infra Shampoo with Cationic Hydration Interlink will provide gentle luxurious cleansing to the hair while providing a balance of moisture for softness and proteins for strength. Suitable for all hair types. Hydrate shampoo. 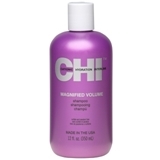 CHI Infra Shampoo with Cationic Hydration Interlink will provide gentle luxurious cleansing to the hair while providing a balance of moisture for softness and proteins for strength. Suitable for all hair types. Application: Apply to wet hair, massage thoroughly. Thoroughly wash your hair, if necessary, repeat the procedure. Shampoo can be used daily. 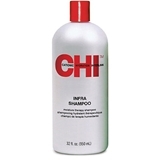 For better result we recommend you to use thermal protective treatment from CHI Infra Repair. Gently cleanses and reconstructs damaged hair by replenishing natural keratin levels. 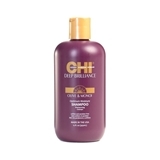 Shampoo gently cleanses the hair with a rich luxurious lather while boosting volume and body to each strand of hair. 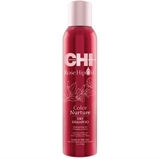 Your hair is left clean with movement and shine.﻿Sulfate and paraben free. Gently cleanse and rid hair and scalp of impurities while balancing oils and strengthening the hair cuticle. Key Ingredients & Benefits: • Tea Tree Oil – Natural antioxidant unclogs pores and removes build up while replenishing moisture to soothe and condition the scalp. • Peppermint Oil – Provides a refreshing and awakening sensation while helping to normalize and balance scalp oils to relieve dry scalp. • Silk – Replenishes moisture while adding strength and shine. 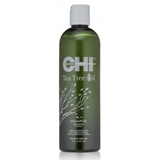 • Chamomile – Protects and maintains hair’s strength and resilience, building a natural layer of resistance to damaged. Although it’s unlikely do a better job than a separate body wash, shampoo, and conditioner, if you’re going to the gym or away for the weekend, there’s nothing more convenient. Shame you can’t brush your teeth with it too. FEATURES & BENEFITS: Formulated with Oud Fragrance Body Wash, Shampoo, and Conditioner All in One Cleanses and Eliminates Buildup ProVitamin B5 Provides Moisture and Improves Elasticity Paraben, Sulfate, and Cruelty Free DIRECTIONS: HAIR: Apply to wet hair and lather well. Rinse thoroughly with water. 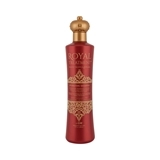 BODY: Apply a generous amount to body and lather well. Rinse thoroughly with water. This unique formula contains a blend of saw palmetto, pea sprout, chia seed, eucalyptus, and ashwagandha to make your hair look and feel fuller—all while preserving its natural balance. It gently cleanses the hair and scalp, and eliminates build-up and impurities while increasing hair’s strength and density. Concentrate on your hairline and behind your ears—the places your scalp produces the most oil. FEATURES & BENEFITS: Formulated with Oud Fragrance Increases Appearance of Thicker, Fuller Hair Paraben, Sulfate, and Cruelty Free DIRECTIONS: Apply a small amount to wet hair and massage into hair and scalp. Rinse hair thoroughly with water.